I am intrigued by traditional English puddings because they have such great comfort food qualities to them. A rich bread pudding is my all-time favourite dessert obviously. However, I do wish to expand my repertoire. 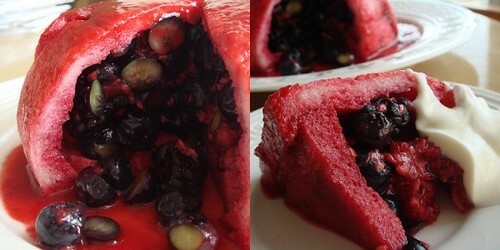 Summer pudding is a simple pudding of a mold lined with bread and filled with macerated fruit. In those hot summer months when berries are aplenty and turning on the oven is the last thing that I want to do, this is a wonderful dessert to make. The following isn't really a recipe but more like a general direction of how to assemble a summer pudding. Depending on the size and shape of the mold that you use, the amount of ingredients varies. Line the mold with plastic wrap with plenty of overhang. I prefer to use a round bottom bowl of about 5 inches diameter for easy unmolding. Wash and dry the berries. In a large bowl, toss together berries with sugar, lemon zest, lemon juice, and Grand Marnier. Let it macerate for about an hour in room temperature so the sugar can draw out juices from the berries. If you use blueberries, you may want to lightly crush some of them. Trim the crust from the bread. Cut the bread to size so that they line the inside of the bowl neatly. Neat is the key here because once you unmold, your handiwork will be the exterior of the pudding! You want it to look pretty. Fill the bread-lined bowl with berries and juice. Close your pudding with one layer of bread. Fold the overhanging plastic wrap over the pudding. Over the pudding with a large plate and weigh down the plate with...something heavy such as a large can of tomato. Chill in the fridge for at least 24hr until the juice saturate the bread. You want the bread to turn from white to deep pink. When you're ready to serve, unmold the pudding and peel off the plastic wrap. Drown with more raspberry puree if there are still any white area on the bread. Serve with creamy yogurt or for a richer alternative, whipped mascarpone cheese. Who Said I Don't Have A Hot Temper? I lost my temper at practice last night because someone jokingly called me names. I've fought for years to keep my temper under control but that does not mean I do not get upset. It only means I've gotten better at not letting my temper get the best of me. However, I didn't let those comments slide last night as I normally would do. Unfortunately, I did not react in a way that explained why I was upset by such comments. Rather, it just looked like I got angry totally out of proportion (and people could conveniently brush it aside as oh-must-be-PMS). MM once told me that an adult-based sports club lacks a ready-made volunteer base (aka parents) that most children-oriented clubs have. In order for the club to flourish, it requires dedicated volunteers from club members. Yet with everyone leading such busy lives, it is difficult to recruit any volunteers. MM is a person whose opinion I respect. Since I started skating, my club has provided me with many resources and opportunities to develop into a better skater. For that reason alone, I decided that I want to give back to show my appreciation. I am offended when I am being made fun of for being responsible, dependable, and organized. Those are valuable qualities which allow me to contribute to the operation of the club. Those are the very qualities that get things done. Volunteering my time and effort is not something that I'm required to do. Standing aside and laughing at people are easy and effortless. However, when was the last time you get anything done without making an effort?